These pork chops from my friend Rob are amazing. His was the first one I ate in probably 15 years, and oh boy, I was missing out on pure deliciousness for a long time. I got a craving and used his recipe to make them myself, and you should too. The pork chops are brined in a concoction that smells like fall for 12 hours and then seared on a grill. Rob serves his chops with peppers and onions, but I stuck with sautéed onions here. 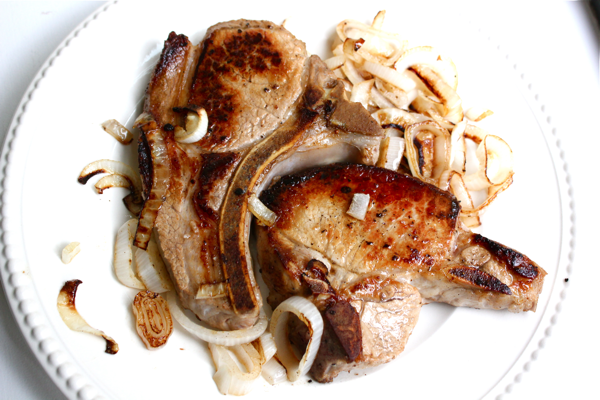 Except for a bit of planning ahead, these pork chops are a great weeknight meal. Make the brine at night, put it in the fridge, drop your pork chops in the brine when you wake up, and sear them when you’re ready for dinner. Fancy and quick! To make your brine, add these ingredients to a pot: 1 gallon of water; 1 cup of apple cider vinegar; 1 cup of brown sugar; 1 cup of Kosher salt; 2 tablespoons of black peppercorns; 2 tablespoons of whole allspice; and 6 bay leaves. I quartered these amounts for my 2 pork chops. Bring the brine to a boil (tongue twister alert! ), and then let it simmer for 10 minutes. Let the brine cool to room temperature, add in your 1-inch thick pork chops, and refrigerate them for 12 hours. Once that time is up, heat your grill, and dry your pork chops so they get a good sear. Season both sides of the pork chops with salt and pepper, and then cook them on both sides until they are done to your liking. They should be wonderfully flavorful and moist from the brine. Enjoy! My chops are in the brine. Can’t wait to make these tonight. 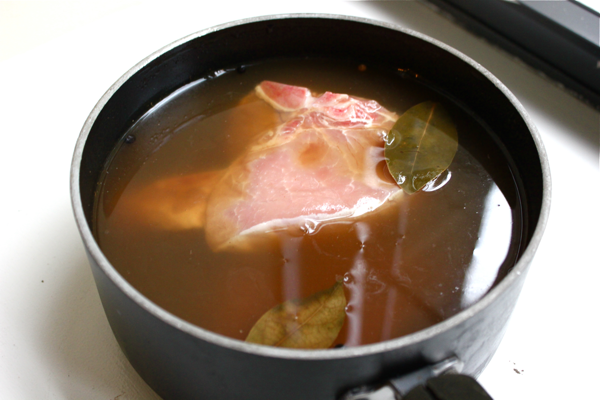 LOVED cooking the brine last night…made my kitchen smell delicious! !